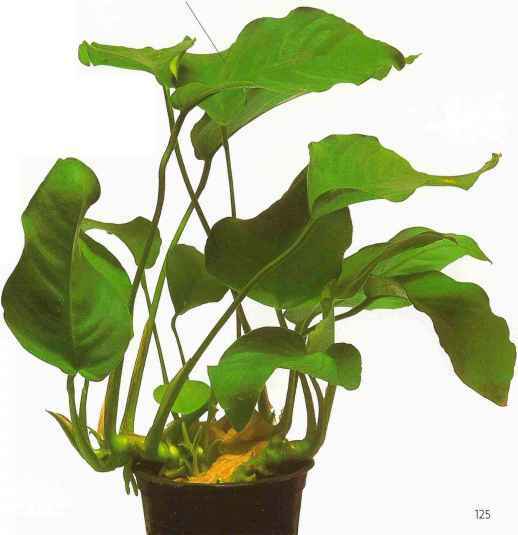 Above: Anubias sp. can be planted on rocks, wood, or In the substrate but the rhizome (the thicker root) must be in open water, otherwise it may die. Anubias plants are a highly robust, undemanding, and adaptable group that can be used in a number of ways in the aquarium. 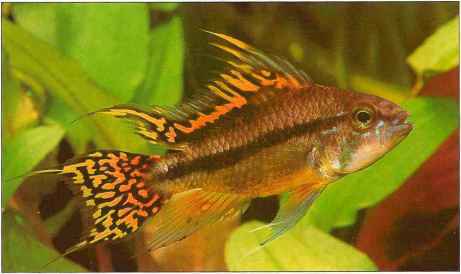 The plants come from various river and stream areas in Africa and are usually found on the edges of waterways and in marsh conditions. They have an adapted rhizome and roots that will attach to solid objects, such as wood or rocks, so substrate conditions are unimportant. 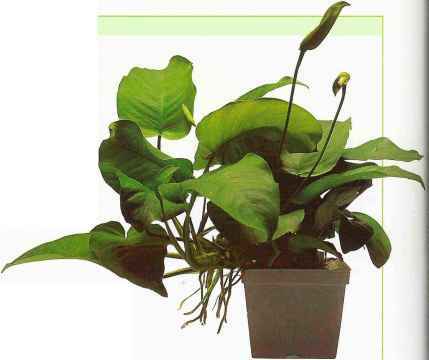 With the minor exception of Anubias gracilis, lighting is unimportant; indeed, bright lighting may even slow plant growth. In open-topped aquariums, anubias can be grown out of water, providing the root is either submerged or in very wet conditions. 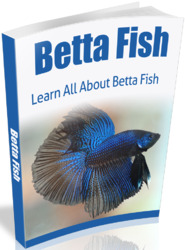 This makes it ideal for use in bog aquariums or paludariums. Some anubias will produce flowers and fruit on long stalks. The leaves of this Anubias sp. are tough and will withstand many conditions. This common Anubias species is an adaptable and robust plant that can be used in a number of ways in the aquarium. The main root, or rhizome, must be placed above the substrate, preferably attached to rock or bogwood, otherwise it may break down and die. As long as water is available to the root, the plant will grow above water or in bog conditions. 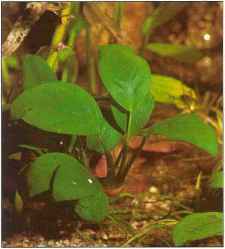 The leaves of the broadleaved anubias are thick and sturdy and will survive the attentions of large, boisterous, or herbivorous fish. 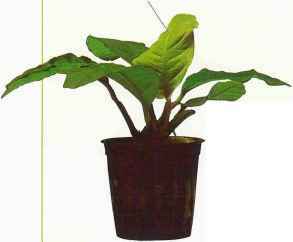 The plant will live in a wide range of lighting conditions, but in brighter light the leaves are more compact and new leaves grow more quickly.